If this is truly Good vs. Evil, how could so many be on the sidelines? A number of people have asked for a little ‘tutorial’ about the background, particularly political, of how things got this way. It truly is a complex, multifaceted and dynamic situation, so no one would be well-served with any source that purported to explain it all in just a click. Some good background for English speakers might be found on the Kyiv Post website. The “Timeline of the Euromaidan” article in Wikipedia is a good place to get orientated… though it’s not a quick read. While I will gladly return to comment more extensively on politics, allow me to make a simple request at this point: If you’re not already with it, don’t spend a lot of time trying to untangle them at this point. There are some very significant political (and economic and cultural and other) questions to which it is very important to find workable answers. But, at a deeper level, what has impressed me about Maidan is not its politics (in the sense of being pro-EU or anti-Russia). 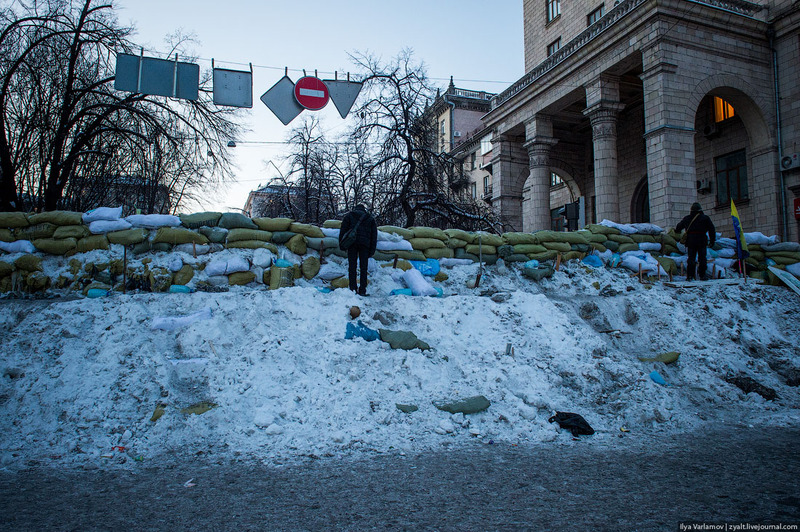 People are not standing through the cold Ukrainian winter for politics. For most of the people with whom I spoke, they are there for more basic concerns: human rights and dignity, democracy, endemic corruption affecting practically all aspects of daily life, justice, decency. We and the Russians are brothers by blood. But never brothers by slavery. One thing struck me immediately upon my return… how little things had changed overall and how amazingly confined the sense of distress and disturbance (which characterized all media-dispensed descriptions of the place). I traveled from the airport into the city and along the River Drive, which passed right below the city center area where the most violent clashes and the largest crowds were gathering, right down the hill from where all those “scary pictures” – which had (finally!) gotten the attention of my American neighbors – were taken. If I hadn’t been informed in advance that things were afoot, I doubt that I would have noticed a single thing out of place, a single indication that the future of the country was hanging in the balances. 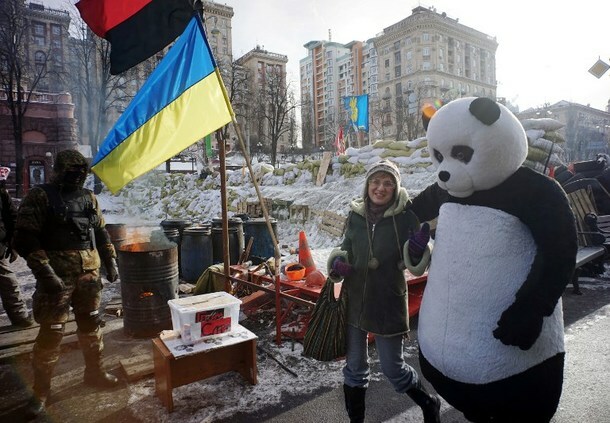 Ukrainians are noted for their fatalism. 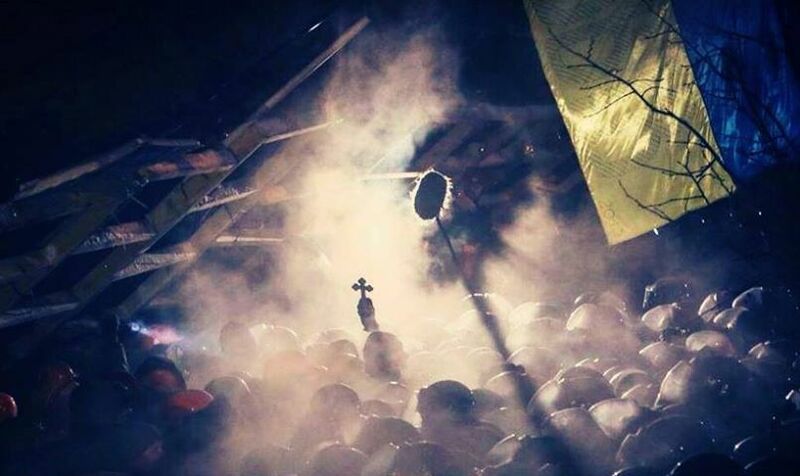 One of the signal features of the protest movement (and one which seems to fuel the many stories of people being hauled in and brutally interrogated to give up information on “Who is behind these protests?” “Who is organizing this?” It is hard for many people to believe that so many Ukrainians are throwing off the mantle of resignation and demanding change. Several hundred thousand people? Could that be? I was struck by the pervasive normality of city life everywhere more than a ½ kilometer away from the “epicenter” both on my trip into town as well as during my travels throughout the city in the last week. Behind closed doors, among their family groupings, people are practically obsessing over every nuance of daily and hourly reports. But, walking through the city, going to and from work, shopping, waking the dog, picking the kid up from school… none of this seems touched by these events which are threatening the survival of the nation. Is this a sign of strength? Of admirable stoicism? Or of weakness? Of premature surrender… to whomever is winning or does win? I have returned from across the sea because I believed what was playing out in society was of critical significance. But so many, millions, of people seemed not to be willing to allow even a crack to penetrate the façade of their day-to-day routine. Is this the patience it takes to survive for generations of oppression? Or is it the complicity that comes from making one’s peace with evil and going on as if it were nothing. This complacency would be one thing if all that was in view was “simply politics” (as usual). Of course, in a sense, it IS “politics as usual” which is why this is so deeply disturbing on so many levels. But, as one becomes further immersed in the flow of events, an unshakeable feeling coalesces and then intensifies. This is not just a clash of cultures or of political forces or between some basically good people asking some people doing basically bad things to stop, or at least be replaced by basically good people. There is truly evil that exists and that has influence in this world through which we are passing. There are times when the grasp that evil has – on levers of power, over schemes of humans, things which gain a juggernaut-like momentum of their own, over people who have “given themselves over” to corruption – becomes a force in its own right. One might be able to find shelter from an attack by clubs or stun grenades within the walls of a building taken and fortified. But where can one be safe from the ravages of such a comprehensive spiritual attack? The Psalmist writes: “O righteous God, who searches minds and hearts, bring to an end the violence of the wicked and make the righteous secure.” (Ps. 7:9, NIV) Here, amid the anxiety that seems to be permeating every conversation I have (though seldom visible on the faces of passers-by) I know more than ever that our only true security is found in the Lord, is built upon our faith in him. However, I sense more than ever that these are not just words… that He does in fact offer real security. In times when everything seems to be going well (while we are trusting in “society,” wise (earthly) leaders, “progress,” “democracy,” “prosperity” or anything else), we might FEEL more secure. But – at all times – we need to be turning to Him. Could that be why the theme of suffering is so significant in the Gospels and the Epistles? If I am correct, and this truly is (or at least contains elements of) a true “spiritual battle,” then I am far less frightened by the dangers of the battle taking place in the central 3% of the city’s geography than by the spirit of “stoicism” which envelops the other 97%.